Both Matt and I have eaten at RAMEN YAMADAYA and both had excellent meals there, this time however was a huge disappointment. I came in an hour before closing and ordered a Chicken Karrage, which was absolutely fantastic. 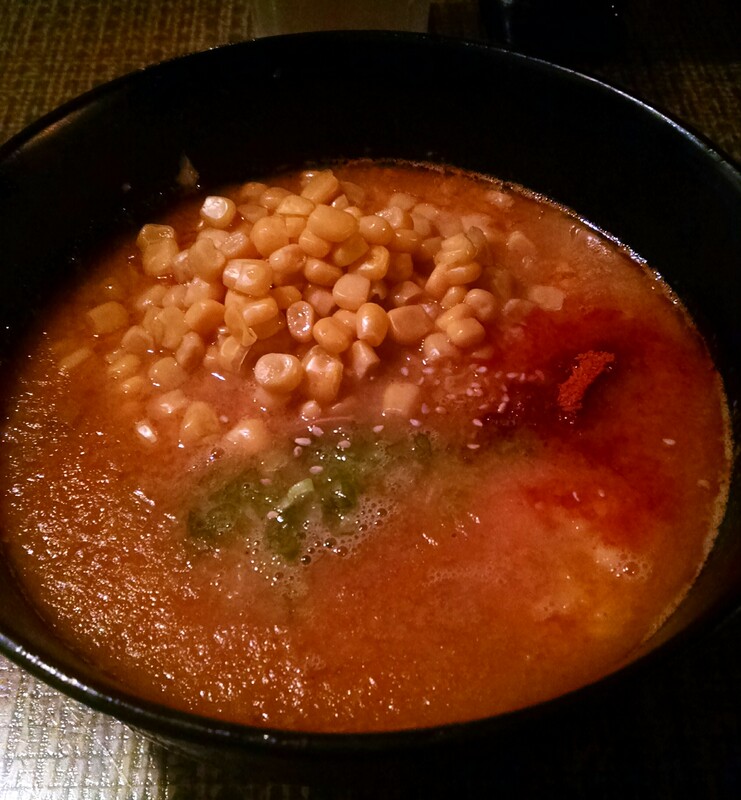 I also went with my standby, Spicy Tonkotsu Ramen but here’s where it all fell apart. The Ramen was warm but not hot, the spice was non-existent, the noodles were overcooked and the egg was horrible. While the broth itself was tasty, it started to get that congealed texture pretty quickly as it wasn’t hot enough at point of serving. While the corn was great and the onions top notch, the spice powder lacked the punch I was expecting for a “spicy ramen” and the noodles were so overdone I thought they were going to fall apart on my chopsticks. The pork was good but the egg, the egg, oh, the egg… the egg quite honestly was old. Felt like it was prepped the day before, left to sit out and deposited it in my late night bowl the next evening. I was really disappointed. Every shop has an off night and maybe I shouldn’t go for Ramen so close to closing time but as a business, you should be expected to deliver top quality product during your business hours, anything less in unacceptable. I’m still a fan of YAMADAYA but it may be a while before I return. 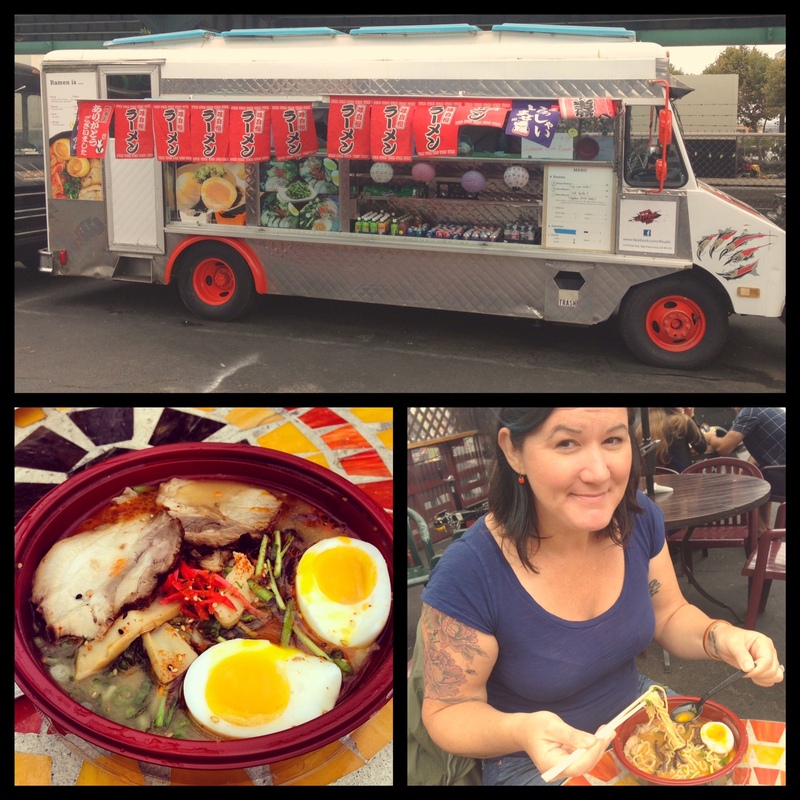 When you think of food trucks, you rarely ever think Ramen but one fateful Saturday afternoon, I was proven wrong. As my wife and I walked around the Soma Streat Food Park in San Francisco, I spotted a few people tucking into some ramen. I thought to myself, Ramen from a food truck? I gotta try this! After looking around, I finally found the LEI FENG JAPANESE FOOD TRUCK with a modest line of five people. Lei Feng is known for their Sushi but here they were, serving Ramen in style from their very own Truck. 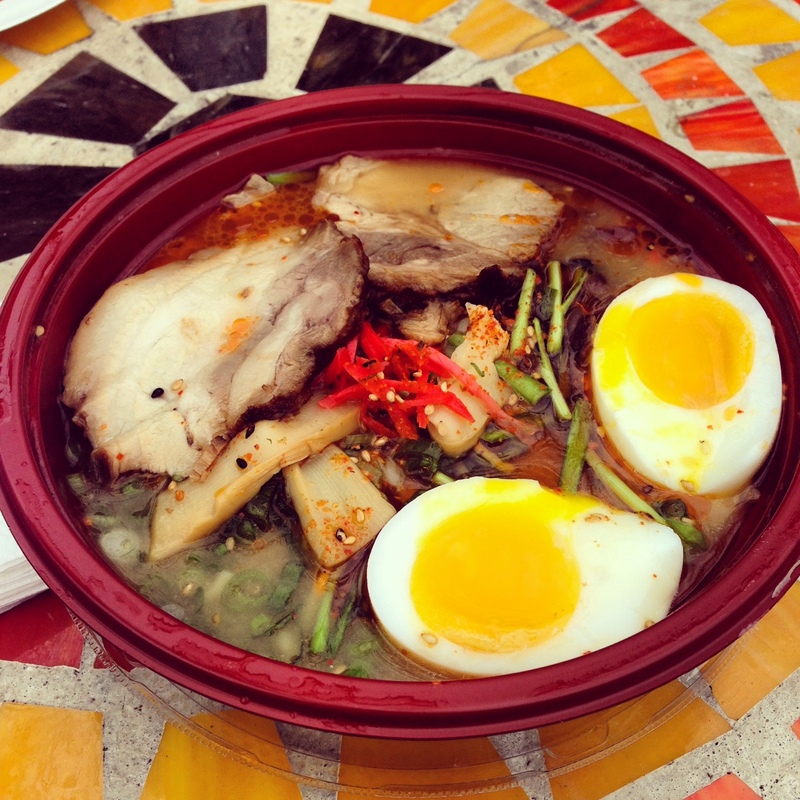 The menu boasts three flavors: Shoyu, Shio or Miso, along with four Add-ons: Egg, Kimchi, Chashu or Corn. Finally the broth itself is pork-bone based and simmered over 5 hours which is decent for a food truck in my opinion. Each bowl comes with: Chashu, Bamboo shoots, Fungus, Green Onion, Chives, Shoga & Sesame Seeds. I opted for the Miso Ramen with an added egg (gots to have an egg) and waited for my steaming bowl of goodness. I was pleasantly surprised with how full my ramen bowl was, lots of pork, a full egg, tons of bamboo & shrooms to boot. There was an ample amount of steam coming off the bowl as well. I was pleased with my first taste of the broth as well, ample flavor with a little bit of richness. Obviously with a longer simmer, there would be far more richness and complexity to the broth but this one was good knowing it was a 5-hour deal. The veggies were fresh and the chashu was on point. I was however, disappointed with the noodles, they were extremely “al dente” and could have used another 30 seconds to cook in my opinion. Overall, I am pleased to say that there is decent ramen available via the LEI FENG FOOD TRUCK in San Francisco. While there are dozens of great Ramen restaurants in the Bay Area where you can find a far superior bowl of goodness, this is Food Truck Ramen and it is surprisingly enjoyable.